For many car owners, now is the time to swap out those winter tires and outfit your vehicle with a set of new rubber. If you've been holding out on getting yourself a new set of tires, now is the time to act. 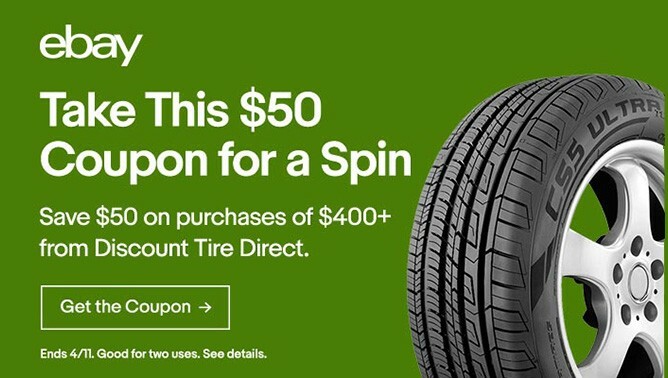 Discount Tire Direct and eBay have teamed up to offer $50 off orders greater than $400 when you use the coupon code PUMPEDUP at checkout. The coupon code is valid until April 11 and it's good for two uses per eBay account, but one use per transaction or cart. Brands you can choose from include BFGoodrich, Bridgestone, Cooper, Goodyear, Hankook, Michelin, Nitto, and Pirelli in sizes ranging from 14" to 22". You can even get yourself a new set of wheels if you like. The discount applies to the purchase price (excluding shipping, handling, and taxes) and cannot be used towards warranties and protection plans.